322 Beacon is located on the north side of Beacon, between Exeter and Fairfield, with 320 Beacon to the east and 330 Beacon to the west. 322 Beacon was designed by Snell and Gregerson, architects, and built in 1877-1878 by Webster and Dixon, builders, as the home of Charles John Whitmore and his wife, Sarah Olcott Murdoch (Blake) Whitmore. They previously had lived at 101 Beacon. Charles Whitmore is shown as the owner of 322 Beacon on the original building permit application, dated November 7, 1877. 322 Beacon was numbered as 320 Beacon until about 1889. 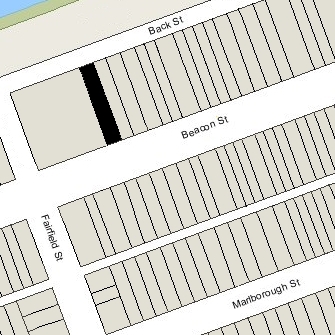 Sarah Whitmore purchased the land for 322 Beacon from the Boston and Roxbury Mill Corporation on August 12, 1878, after the house had been built. Click here for an index to the deeds for 322 Beacon. Charles Whitmore was a wholesale grocery merchant. He also served as treasurer of the Ames Plow Company and, by 1885, was Vice President of the Market National Bank. By 1897, they had been joined at 322 Beacon by Sarah Whitmore’s mother, Mary Elizabeth (Tarbell) Blake Whitmore, the widow of George Blake, Jr., and of Charles Octavius Whitmore. She was also Charles Whitmore’s stepmother, having married his father (Charles O. Whitmore) in 1851. Mary Whitmore died in March of 1898. Charles and Sarah Whitmore continued to live at 322 Beacon until his death in October of 1903. On March 17, 1903, 322 Beacon was purchased from Sarah Whitmore by Sarah Marston (Robinson) Harding, the wife of dry goods and wool merchant Edgar Harding. The Hardings lived at 324 Beacon and leased 322 Beacon to others. 322 Beacon was not listed in the 1904 and 1905 Blue Books. By the 1905-1906 winter season, it was the home of attorney and stockbroker Chester Linwood Dane and his wife, Grace (Oliver) Dane. They previously had lived at 122 Marlborough. They continued to live at 322 Beacon during the 1907-1908 season, but moved thereafter to the Hotel Lenox at 61 Exeter. 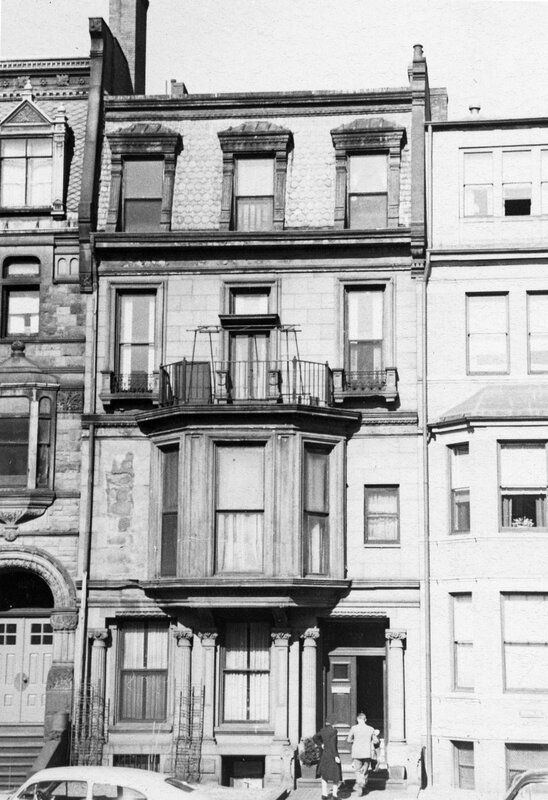 By the 1908-1909 winter season, 322 Beacon was the home of attorney Robert Hallowell Gardiner and his wife, Alice (Bangs) Gardiner. They previously had lived at 77 Marlborough. They also maintained a home in Gardiner, Maine. Sarah Harding died in November of 1912, and on March 1, 1913, Robert Gardiner purchased 322 Beacon from her estate. Robert Gardiner died in June of 1924. Alice Gardiner continued to live at 322 Beacon. By 1925, she had been joined by her daughter, Alice (Gardiner) Davis, the former wife of banker and note-broker Livingston Davis. They continued to live there until Alice Gardiner’s death in December of 1934. The house was shown as vacant in the 1935 City Directory. On April 6, 1935, 322 Beacon was purchased from Alice Gardiner’s estate by real estate dealer Henry C. Brookings, and on April 26, 1935, it was acquired from him by Doreen Simpson (Woodyatt) Bowman, the wife of Dr. Edward Francis Bowman, a physician. They lived (and he maintained his office) at 183 Bay State Road. They also maintained a home in Scituate. In May of 1935, Edward Bowman applied for (and subsequently received) permission to convert the property from a single-family dwelling into a single-family dwelling and doctor’s office. Notwithstanding his application, based on City Directory listings and Boston Lists of Residents, it appears that he converted the property into several apartments and an office. After remodeling 322 Beacon, Edward Bowman moved his offices there. He and his wife lived temporarily at 1 Spruce Court, and then in March of 1937 purchased and subsequently moved to 149 Beacon. He continued to maintain his office at 322 Beacon. Edward Bowman’s mother, Annie (Hoelen) Bowman, the widow of Dr. Winthrop H. Bowman, and his brother and sister-in-law, Wordsworth W. Bowman and Caroline E. (Bessette) Bowman, lived at 322 Beacon. Wordsworth Bowman was a wholesale shoe dealer. The Wordsworth Bowmans (and possibly Annie Bowman) previously had lived at 183 Bay State Road with Edward and Doreen Bowman. Annie Bowman died in 1936 and the Wordsworth Bowmans moved thereafter to live at 149 Beacon with Edward and Doreen Bowman. In March of 1943, Edward Bowman was cited by the Building Department for failing to obtain a permit to convert the property into five apartments, but as of 1945 he still had not filed to obtain one. On May 10, 1951, 322 Beacon was acquired from Doreen Bowman by Patrick O’Connor of Brookline. On January 26, 1952, 322 Beacon was acquired from Patrick O’Connor by Louis J. Binda. He was an elevator starter at a downtown Boston building who frequently held property for various other owners. He was unmarried and lived in Cambridge. On April 9, 1953, Robert J. Sherman (presumably acting on behalf of Louis Binda) filed for (and subsequently received) permission to legalize the occupancy as seven units. Edward Bowman continued to maintain his office at 322 Beacon until about 1954, when he moved it to 287 Commonwealth. On February 5, 1957, 322 Beacon was acquired by the United Business Service Company, Inc., with offices at 210 Newbury. It was in the process of constructing a new apartment building at 330 Beacon, replacing the existing buildings at 324-326-328-330-332 Beacon. In March of 1958, it filed for (and subsequently received) permission to increase the number of units at 322 Beacon from seven to nine. In June of 1960, it filed for (and subsequently received) permission to install a “cooling tower” at the rear of the building for use by the new building at 330 Beacon. On December 15, 1960, United Business Service Company entered into an agreement with the 330 Beacon Street Corporation granting a permanent easement in the rear yard of 322 Beacon for 330 Beacon’s air conditioning equipment. On January 9, 1974, 322 Beacon was acquired from the United Business Service Company by Norman B. Leventhal and Edwin N. Sidman, trustees of the 330 Beacon Street Realty Trust, and on August 15, 1974, it was acquired from them by Jennifer Mary Ryston Wilson and William R. Becklean, trustees of the David-Andrew Trust. On December 23, 2005, 322 Beacon was purchased from the David-Andrew Trust by the First Beacon Real Estate Trust (Jeffrey M. Stitt, trustee). 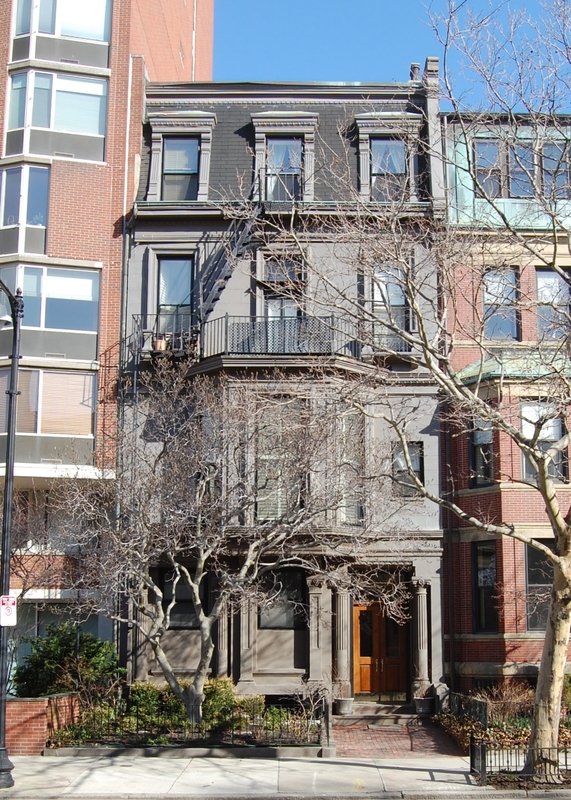 On August 17, 2006, the First Beacon Real Estate Trust converted the property into eight condominium units, the 322 Beacon Street Condominium.